FFM 2017: The Montreal World Film Festival is not dead yet, thanks to volunteers! 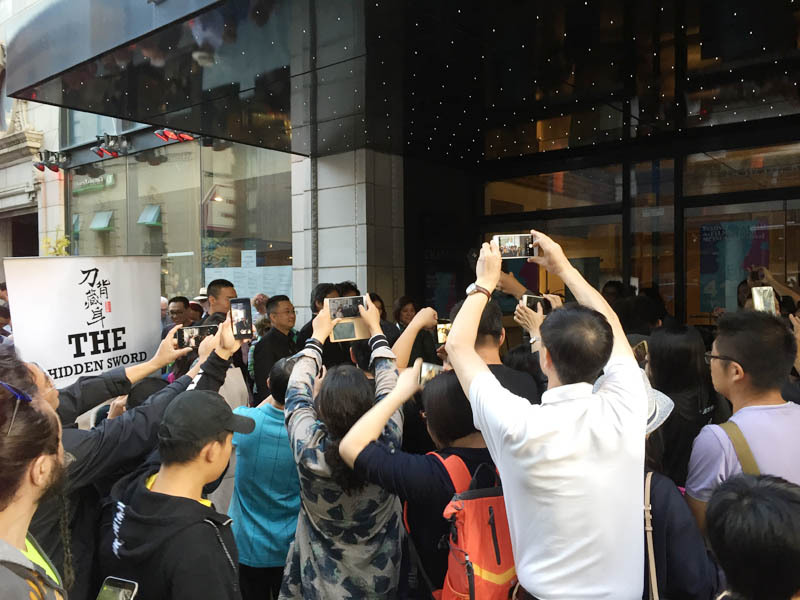 MONTREAL- Sunday, Aug. 27, 2017 – Film fans stretch to catch a glimpse of director Xu Haofeng and his actors before a screening of Chinese film, The Hidden Sword, at the Imperial Cinema. The Hidden Sword is in competition at the 2017 Montreal World Film Festival / Festival des films du monde. Photo by Liz Ferguson. This year, like last year, the Montreal World Film Festival/Festival des films du monde is a shadow of its former self. The festival doesn’t seem to be getting any money from any level of government. All the same, it IS still alive, thanks to some wonderful volunteers! I doff my metaphorical hat to them! You’ll see them selling tickets, working as ushers etc., but there are more unseen workers behind the scenes, as well. Without their work, the cinemas would be dark. While I didn’t formally interview any of them, I can see that the volunteers range in age from their early 20s to 60s, maybe even 70s. While some of the older volunteers are retirees, others are giving up precious vacation days. They are film fans have enjoyed the festival for decades and they don’t want to see it die. Several people now working for free were on the festival payroll for many years. Check out the festival this long holiday weekend. Many directors are here with their films, and some brought their actors, too. Sometimes there are Q&As in the cinema right after the screening, but even if there isn’t one, you can usually ask questions in the lobby. At the very least, if you liked the film, you can thank and congratulate the director. They seem quite willing to have their pictures taken with fans, too. A nice souvenir of the festival! Fans are quite friendly, too. If you ask nicely, most will be happy to tell you what they have seen and what they thought of it. MONTREAL- Sunday, Aug. 27, 2017 – Chinese director Xu Haofeng, second from right, with actors and others associated with his film, The Hidden Sword. The Hidden Sword is in competition at the 2017 Montreal World Film Festival / Festival des films du monde. Photo by Liz Ferguson. Films are being shown at the Imperial Cinema, Cinéma du Parc and the Dollar Cinema. From my own experience I can say that some of them are very good! And people I trust have said the same about other films. So far, I haven’t seen anything that I regret. 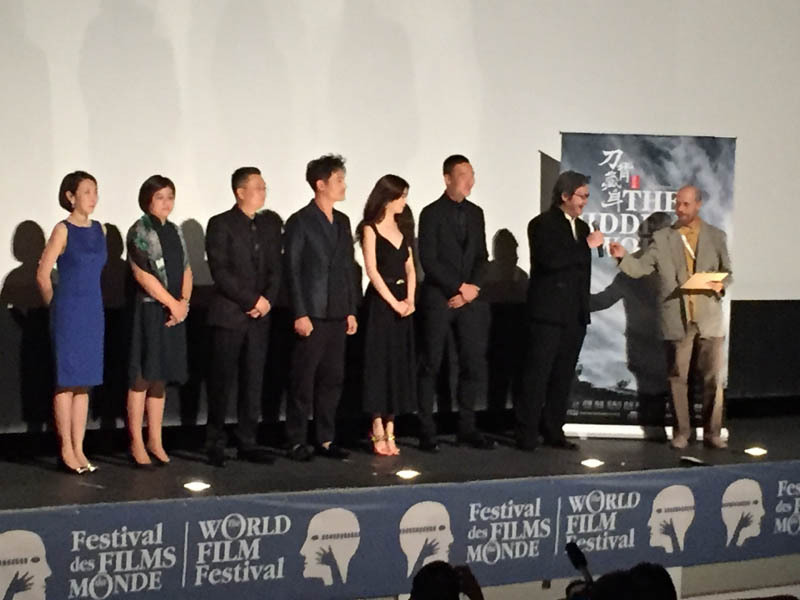 I particularly liked The Hidden Sword, from China, directed by Xu Haofeng, and Y de Pronto el Amanecer, from Chile. It was directed by Silvio Caiozzi. Both films are playing in competition. Links to schedules are below. Unfortunately, there isn’t a fancy printed program this year, nor is there the “big book” of yesteryear, but at Cinéma du Parc, you can pick up a schedule, with synopses, of the films that are being shown there. The Montreal World Film Festival / Festival des films du monde continues until Monday, Sept. 4, 2017. Tickets are $11 each, or you can buy a booklet of 10 coupons, which must be exchanged for tickets, for $85. The Imperial schedule is here. Cinéma du Parc schedule is here. The Dollar Cinema schedule is here. To read a film’s synopsis, click on its category, which will be in blue on your screen. 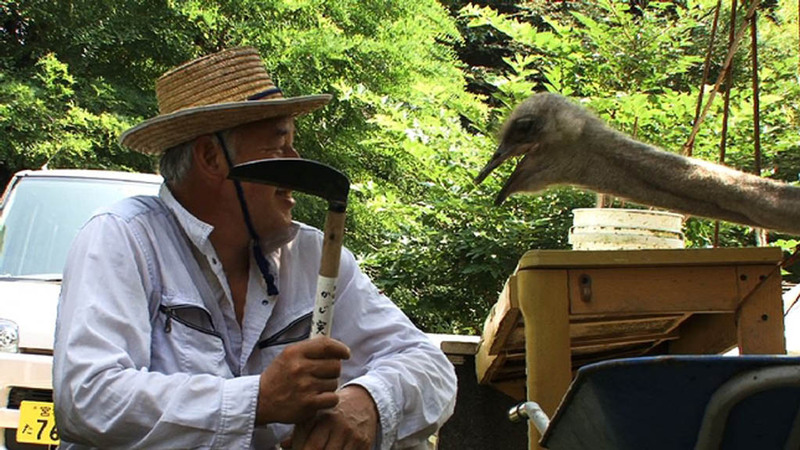 Naoto Matsumura has a chat with one of the ostriches under his care in a scene from the Japanese documentary film Naoto Hirtoriki (Alone in Fukushima), which is being shown at the Festival des films du monde in Montreal. Naoto Matsumura looks after many of the animals that were abandoned after the 2011 meltdown of the nuclear power plant in Fukushima, Japan. Naoto Hirtoriki (Alone in Fukushima) is a documentary portrait of Naoto Matsumura, a man who voluntarily looks after the (mostly) four-legged victims of the disaster at the Fukushima No. 1 nuclear power plant in March of 2011. These include dogs, cats, cows, and a pony. There are some wild boars prowling around, too, though they look like scroungers, not officially under his care. And then there are the two otherwordly ostriches, with their quizzical expression and powerful legs that can break ribs. The nuclear plant went into meltdown after an earthquake and the resulting tsunami. 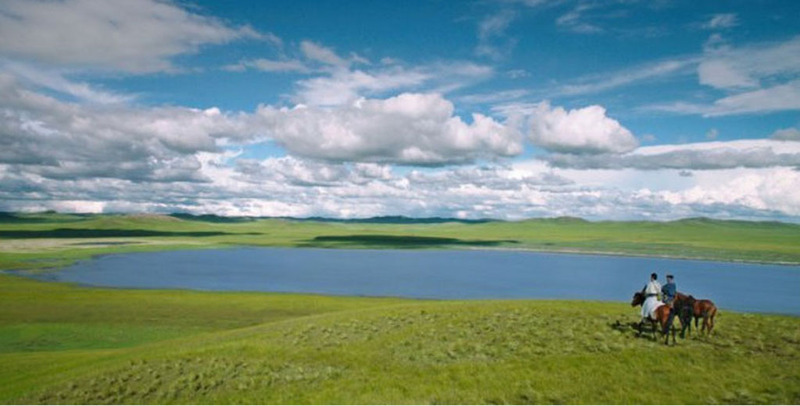 Humans were quickly evacuated because the radiation leak made the area too dangerous for them to remain. Many people had no idea that they would be gone so long. They tied their dogs up and planned to come back for them within a day or so. But they were not allowed to come back, and shelters did not accept dogs and cats, in any case. Some cattle were destroyed on orders of the government, others starved to death, but some were entrusted to Naoto Matsumura, and he continues to look after them to this day. In the beginning, he bought food for them with money from his small pension, now he also gets donations from supporters. 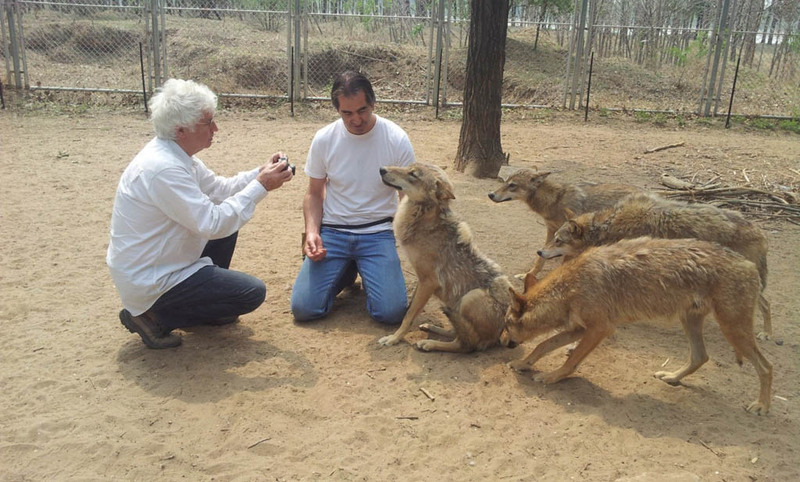 He says he wishes the government would look after the animals, that would be the moral thing to do, and it would also increase knowledge about the effects of radiation. The animals are mammals, just like us, whatever happens to them might happen to humans, too. On a technical level, Naoto Hirtoriki (Alone in Fukushima) is not perfect. Especially in the opening footage, some bright areas are bleached out, and throughout the film, the microphone picks up many distracting sounds – truck engines, and fierce winds among them. 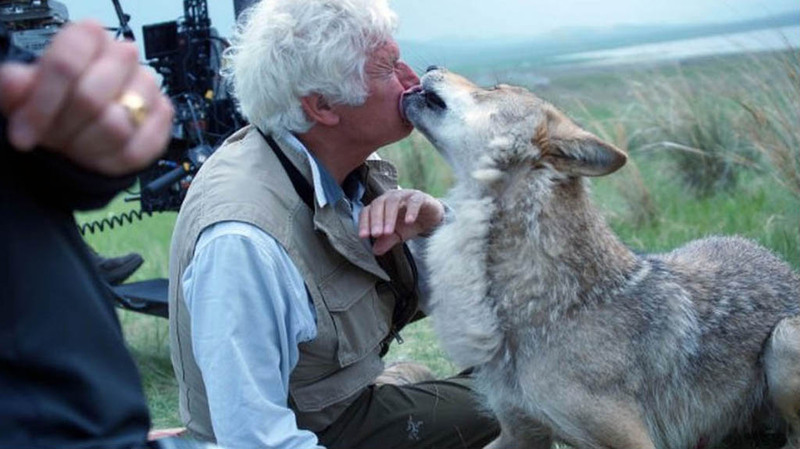 But heart is more important than technique – watch the film to see Naoto feeding and interacting with the animals and describing his feelings of obligation toward them. He tells us how the nuclear plant changed his town of Tomioka – at first it brought prosperity, and conspicuous consumption – a car for every family member! Then came the disaster. It could take 30 years to decontaminate the town; maybe it will never be safe again. He wonders if the decontamination work is really just for show. Film production and Sales : Prod. : Mayu Nakamura, Omphalos Pictures,Tokyo 180-0002 (Japon), tél. : +80 (80) 3408 85 30 missyn510@aol.com. David Chan Cordeiro, left, plays Partridge Kick, and Gonalo Waddington plays the Falcon in a satirical film from Portugal, Capito Falco (The Portuguese Falcon). The film is being shown at Montreal’s Festival des films du monde. UPDATE: I saw The Portuguese Falcon on Wednesday night, and I thought it was pretty funny! The audience seemed to enjoy it, too. I hope to write a proper review after, but just wanted to add this note, right now. On Thursday, Sept. 3, it will be shown at noon. If you work in the daytime, maybe your boss(es) would allow you to take a long lunch to watch it? It’s a thought! 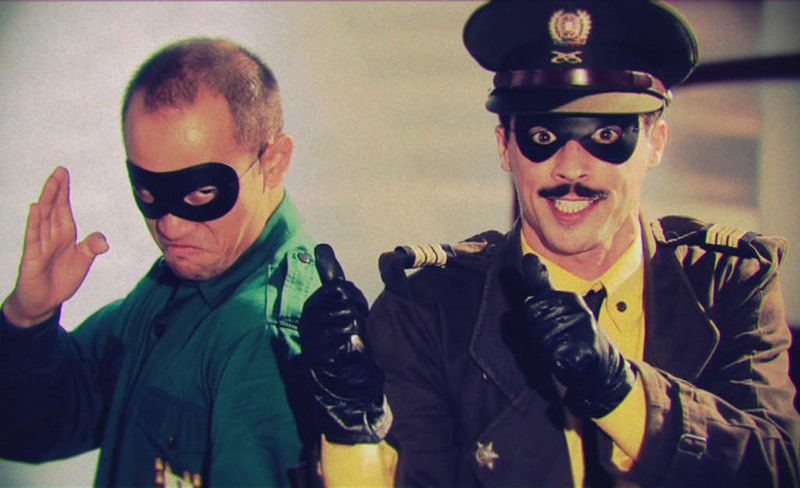 Capitão Falcão (The Portuguese Falcon in English) is a satire on superheroes. Instead of defending truth and justice and the American Way, as such characters usually do, the Falcon and his sidekick defend the fascist regime of dictator António de Oliveira Salazar from commies and feminists in the 1960s. The film was directed by João Leitão, and written by him and Nuria Leon Bernardo. Gonçalo Waddington plays the Falcon and David Chan Cordeiro plays Partridge Kick, who is more or less Robin to his Batman. I haven’t seen The Portuguese Falcon yet, but it sounds like good cheesy, goofy fun, the kind of thing more likely to be seen at Montreal’s Fantasia Film Festival. But we all like to laugh, don’t we? The Portuguese Falcon, in Portuguese with English subtitles, is 106 minutes long.